"These trials will show that your faith is genuine. It is being tested as fire tests and purifies gold--though your faith is far more precious than mere gold. So when your faith remains strong through many trials, it will bring you much praise and glory and honor on the day when Jesus Christ is revealed to the whole world." It took two long years…Awaiting for EEOC’s help and decision for my charge against my employer for what I believed they had done: discrimination against my disability. Not only was I demoted to a Per Diem position from a regular employee status, I was also accused of not disclosing about my disability when I was hired. It was difficult to trace back more than 10 years. I made copies of my own health file. To which I discovered that I did write in my own handwriting, advising the examining Nurse Practicioner during my pre-employment physical about my neck injury I sustained from working in the busy Orthopedic floor from a well-known hospital down south. I saw the range of motions she had me perform. “What is your evidence?” I asked the Sergeant who repeated the accusation during my second meeting with not only her but with three more who held high positions in our work. “Sure…Wait a minute,” she arrogantly responded. She closed the door behind her and after 5 minutes, returned to her vacated seat and handed me a white piece of paper. “But you accepted the Per Diem position,” the EEOC lady stated, interrupting the flow of thoughts that ran like a flood. Memories of my own suffering from those people’s hands during the course of 2 years as I waited. “I never signed anything but I did accept the Per Diem,” I answered. Meaning…I would have been terminated. I was devastated. The help that many people, not just me, looked up to, could never be helpful in the end. I imagined the others who had gone before me with limited resources and who were given no choice but to give up. But as a Christian, I wouldn’t…There was Someone I look up to Who never fails me. His obedience to God should be my model. He endured. He suffered much. And He prevailed. I never got any answers regarding my inquiry for the notice that they needed to give me…The right to sue. It is not about winning money. It is about myself standing up for the abuse of power committed and still is being committed from my workplace. No one I knew had ever stood up. It was just fight of words. I never saw actions. I don’t want my experience to happen to anyone else in that place. If this is what God wants for me to do at this time, I will never give up until I do get that truth whether my employer discriminated me or not. I have no fear because I know this is the right thing for me to do. And that’s how it is when it comes to suffering. It can be costly. Most of the time. But it is worthy in the end. 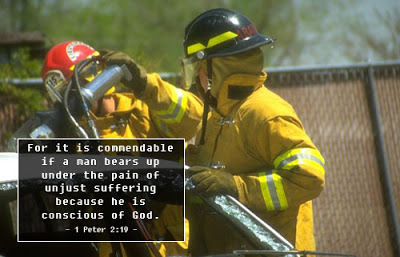 Especially when we suffer for Christ. Knowing He suffered for us in the first place. We have different trials that we are in. But such life’s storms can help refine our faith even more. To God be the glory. (Please pray for me and my husband as we travel this Wednesday and try to get clarification from EEOC. Please pray that the Lord will give me His wisdom and discernment. May the right lawyer hear my case and defend me though I trust in our Greatest Advocate...Thank you to all of you who are always quick to release their breaths of prayers. A song to our Lord’s abode. God bless and protect us all).